Hello and Happy Tuesday! Hope your week is going great so far! It's been really hectic for me but I'm always happy to come home from my crazy busy day job and have some relaxing time in my craft room! Crafting is my happy place! 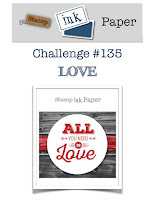 So this week over at Stamp, Ink, Paper it's all about Love! Hope you'll take some time to head over and link up your own love themed card! I loved the pink shimmery cardstock that was included in the kit. I decided to use part of it for a front layer with that cool heart die cut out of the middle of it. Once I die cut the heart I poked out all of the cut out pieces and then added the heart shape back into the piece of cardstock. I added some Multi Medium Matt adhesive on the back side of it and then added a scrap piece of basic black cardstock to the back of the panel. My card base was an 11" x 4 1/4" piece of 110# Neenah Classic Crest Solar White Cardstock. I added a beautiful a 5 1/2 x 4 1/4" piece of SU Petal Passion DSP to the front of the card base... I LOVE the black and white! I then added my shimmery pink front panel onto the top of the Petal Passion with foam tape. I heat embossed the sending love sentiment from the MMH kit in white onto a small strip of Basic Black cardstock and added it to the front. I added three of the sequins from the kit and then topped them with glass seed beads. I added two additional glass seed beads directly to the card front. I finished this one off by adding some black and white twine across the top by tying it in a bow and curling the ends. Awesome card. I love the way you used the die pieces as a layer! Love the black and pink, one of my favorite combos.